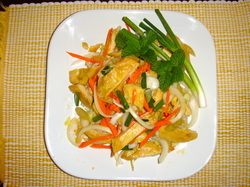 Thai salad with lettuce, cucumbers, onions, tomatoes and fried tofu, served with homemade peanut sauce. Salad with lettuce, cucumbers, onions, tomatoes \with the choice of Balsamic, Ranch or Italian. 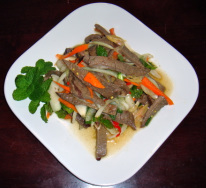 Sliced Beef grilled and mixed with onion, carrot, scallion, lemongrass, mint, ground sweet rice, lime juice and Thai spices with Thai dressing. 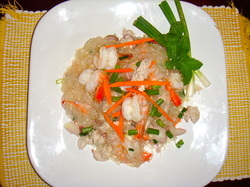 Steamed shrimp mixed with onion carrots, scallions and clear noodles with Thai dressing. 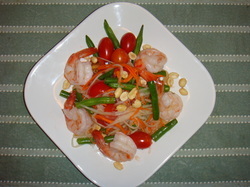 Papaya, grapes tomatoes, green bean, carrot, ground nut and shrimps with Thai famous sour.